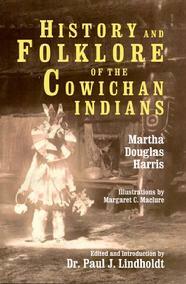 In the late 1800s, Martha Douglas Harris, the daughter of the former governor of British Columbia, observed that "civilization" was destroying the "native dignity and wholesome life" of the Cowichan tribe of Vancouver, "substituting much evil for the real good found in their former customs and character." She herself was part Cree Indian—a fact that her father was none too eager to make public. But he and her mother had long since passed away, and so she wrote this book of 20 folktales in 1901, partly to honor her Native American heritage. Contents: The Enchanted Bear, The War Song, The Thunder and Lightning Bird, Children of the Moon, The Two Sisters and 15 other classic stories about the Cowichan and Cree tribes.